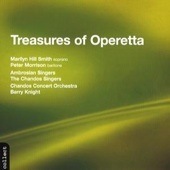 Marilyn Hill Smith and Peter Morrison have recorded three volumes of favourite works from the Operettas. They are all sung in English. Chandos re-released a selection of these songs in a double album in 2004.